The brain is second only to the liver as a source of apolipoprotein E (APOE for gene; ApoE for protein), a protein which is intricately involved in lipid transport and metabolism. Following genetic linkage of late-onset familial Alzheimer’s disease to chromosome 19 and the identification of ApoE in senile plaques, neurofibrillary tangles and amyloid-laden blood vessels, over-representation of the APOE ε4 allele was recognized in both familial late-onset and sporadic Alzheimer’s disease. A dose-dependent association of the APOE ε4 allele with increasing cerebrovascular amyloid β-protein deposition was subsequently identified. Lobar hemorrhage is the major clinical manifestation of cerebral amyloid angiopathy (CAA) and is thought to follow the development of CAA-associated vasculopathic complications such as fibrinoid necrosis and concentric (“double barrel”) blood vessel formation. There is emerging a complex relationship between APOE ε4, APOE ε2 and hemorrhage associated with CAA. For example, pathological studies have demonstrated that the APOE ε2 allele, the least frequent of the APOE alleles, is over-represented in patients with CAA-related hemorrhage. This is also true for patients with co-existing Alzheimer’s disease, who otherwise have a very low ε2 allele frequency. Other forms of intracranial hemorrhage (hypertensive and subarachnoid hemorrhage) do not share the same association with APOE ε2. Patients with the ε2 allele and CAA-related hemorrhage are more likely to have taken anticoagulant or antiplatelet medication, have had hypertension or minor head trauma than non-ε2 carriers. 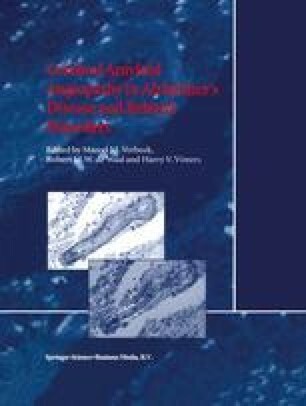 In addition, there is now evidence suggesting that the ε2 allele enhances CAA-associated vasculopathic changes such as fibrinoid necrosis or concentric blood vessel formation. The role of APOE in other manifestations of CAA, including leukoencephalopathy and transient neurological deficits, is currently unclear. Besides being a risk factor for Alzheimer’s disease, CAA and CAA-related hemorrhage, APOE genotype can also influence outcome following acute brain injury. By an as yet unidentified mechanism the ε4 allele is a marker of poor prognosis after head injury and intracerebral hemorrhage. Study of APOE has provided useful insights into the pathogenetic steps leading to CAA and CAA-related hemorrhage. Its influence on CAA and outcome from acute brain injury tantalizingly offers new prospects for future therapeutic interventions.